Tales about the Wild West have been pretty thin on the ground lately, with the exception of the occasional film. When I was a child it was very different. There were masses of series on television – Tenderfoot, Wells Fargo, The Lone Ranger, Wyatt Earp, Bonanza – there was a serial on Saturdays at the cinema, and every library devoted a special section to Westerns (along with one to Romance and another to Mysteries). It was all very clear-cut: the Indians (mostly) were the baddies and the cowboys (well, some of them) were the heroes. Then that changed. Films like Soldier Blue came out, and books like Bury My Heart At Wounded Knee. It became clear that a great wrong had been done to the Indians, and the simplistic landscape of all those old books and serials plummeted out of fashion. But something was lost here. 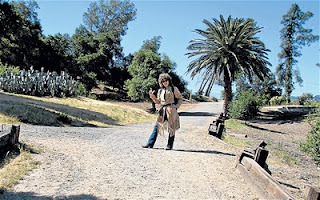 With its extraordinary characters, its lawlessness and its dramatic setting, the American West provides a wonderful breeding ground for adventure – and Caroline, herself American, has, thank goodness, seen its potential and seized on it as the setting for her new series. At the beginning of the first book, The Case of the Deadly Desperadoes, Pinky solemnly announces that: ‘My name is P.K. Pinkerton and before this day is over I will be dead.’ Pinky tells it like it is. What makes this particularly interesting is that Pinkie doesn’t see things like other people do: he has a ‘Thorn’. This Thorn – his Problem – is that people ‘confound’ him. He cannot understand their expressions, and he doesn’t show emotion himself. For instance, his adventure starts when he finds his foster mother and father dead, killed and scalped by desperadoes disguised as Indians. He realises that they are after a document which is almost all he has left of his real mother. He catches the stagecoach to nearby Virginia City – where his adventures really get going – and meets up with all kinds of colourful characters – including a young Mark Twain, there as a reporter. But at first, no-one believes his story – how could he speak in such a cold and matter of fact way about the deaths only that morning of his foster parents? But they quickly realise he’s telling the truth when Whittlin Walt, so called because he ‘whittles pieces off his victims while they are still alive’, appears, with P.K. firmly in his sights. There follows an action-packed chase, involving Soiled Doves (saloon girls), opium dens, Celestials (Chinese), and a fabulously cool gambler called Poker Face Jack – who sees considerable advantages to Pinky’s Thorn. The whole thing is tremendous fun, and rips along with great panache. But to my mind the most appealing thing about it is the character of Pinky: serious, conscientious, brave – and constantly puzzled by the people he meets. Caroline Lawrence is incredibly skilful in the way she tells a story which is so funny, so full of variety, through the lips of a boy who himself has no sense of humour and no ability at reading faces. I think children will love it.